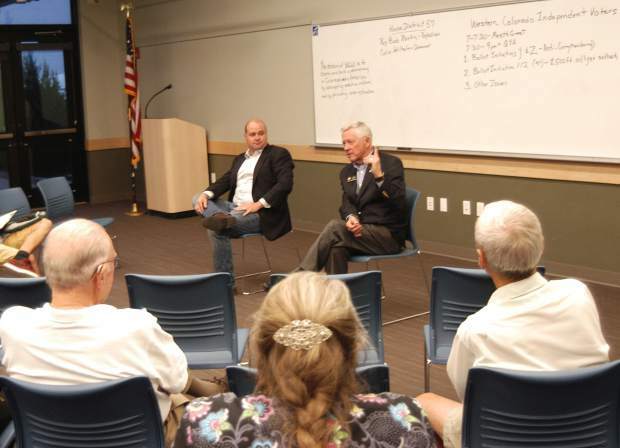 The recently formed Western Colorado Independent Voters hosted a town hall forum Thursday at the Glenwood Springs Library between Republican incumbent Rep. Bob Rankin and his Democratic challenger Colin Wilhelm for the Colorado House District 57 seat. Up for re-election, Rankin hopes to keep the HD 57 seat that encompasses Garfield, Moffat and Rio Blanco counties warm and red, while Wilhelm believes the position Rankin has held since 2013 needs a new, blue voice. The Q&A moderated by WCIV organizer Randy Fricke focused primarily on the candidates’ views on several state ballot initiatives, particularly those involving redistricting, oil and gas drilling setbacks and education. 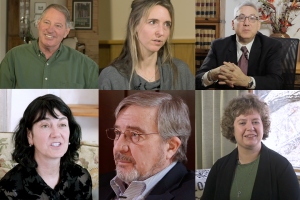 Initiative Y would turn the responsibility over to an independent commission comprising 12 citizens — one-third unaffiliated, one-third affiliated with the state’s largest political party, and one-third affiliated with the second-largest political party. Currently, that’s the Republican and Democratic parties. Wilhelm supported both initiatives, as did Rep. Rankin, citing bipartisanship. “We absolutely support this on my side of the aisle as does the other, so I highly recommend everybody vote for it,” Rankin said. The WCIV has also endorsed the redistricting ballot issue. 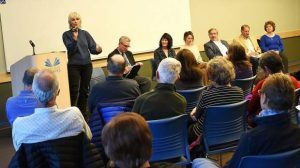 Where the two candidates differed was Ballot Initiative 112, which would require an oil and gas drilling setback regulation of 2,500 feet from homes, schools and other occupied buildings. 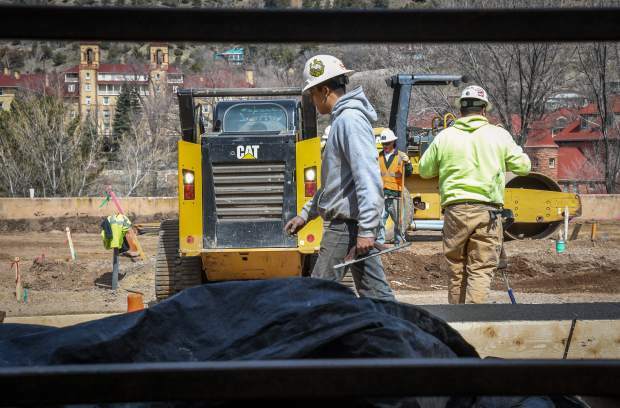 Rankin described himself as “unapologetic supporter” of fossil fuels and boasted Colorado’s record of safety because of the current regulations already in place — regulations the Carbondale Republican believes do not need more drilling into. 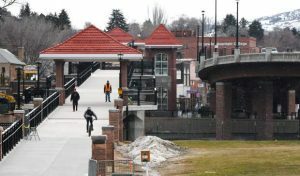 A believer that the oil and gas industry would stay regardless of whether Ballot Initiative 112 passes, Wilhelm steered the oil and gas discussion to one of health and safety, or in his mind the lack thereof. Wilhelm did say he would have preferred the measure impose a setback of 1,500 feet, rather than 2,500 feet. But the bottom line is health and safety, he said. Both candidates did strike some common ground when it came to the issue of education reform. “Are we paying our teachers enough? No,” Rankin said. “Free tuition would take a long time to evolve in our system,” Rankin stated. Neither candidate favored the idea of tenure protection for teachers. The general election will take place Nov. 6, and will include other contested races locally, regionally and statewide. Among them are races for Garfield County commissioner between Republican incumbent Tom Jankovsky and Democrat Paula Stepp, and a contested race for Garfield Clerk and Recorder between incumbent Jean Alberico, a Democrat, and Republican Bonnie McLean. Candidates for county office, as well as the HD 57 candidates, will debate again at the Oct. 10 Issues & Answers Forum in Glenwood Springs, sponsored by the Chamber Resort Association, the Post Independent and KMTS radio. On the regional front, incumbent U.S. Congressman Scott Tipton, a Republican, is running for re-election against former Routt County commissioner and Democratic state Rep. Diane Mitsch Bush for Colorado’s 3rd Congressional District. And the statewide ballot includes a high-profile race for the open governor’s seat between the current state treasurer, Republican Walker Stapleton, and Democratic U.S. Congressman Jared Polis. 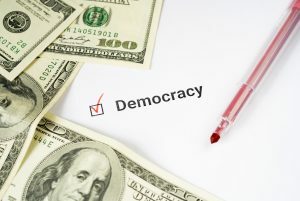 “The mission of Western Colorado Independent Voters is to create and build a democracy in Colorado and in America by advocating election reform and providing voter education,” Fricke stated to begin the Thursday night forum.